"Metal Maniacs! 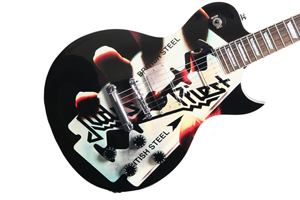 The Official JUDAS PRIEST Artist Series Guitar has arrived in limited quantities! Every ASG is made to order, that means you can customize your JUDAS PRIEST ASG and make it as gritty and heavy as the featured British Steel album art. Check it out now HERE." "ASG and JUDAS PRIEST have worked together to create the guitar that perfectly represents this iconic album, and the results are stunning. Here’s the catch: Only 30 hand-numbered British Steel models will ever be produced, each finished by master craftsmen in our Fullerton shop and shipped with a certificate of authenticity. Ros³aw Szaybo’s distinctive razorblade-in-hand cover art bursts off the hand-carved Mahogany top, complimenting the single cutaway guitar’s solid Mahogany body, rosewood fingerboard, Mother-of-Pearl trapezoid inlays, Gravedigger headstock, custom ASG Arsenal pickups and chrome ASG headstock emblem. This one-of-a-kind axe is bound throughout and is perfect for any metal fan whether it will be displayed on the wall or shredded on the stage. Only a limited amount of these sharp, custom JUDAS PRIEST guitars by ASG will ever be made, and they’re sure to sell out fast."